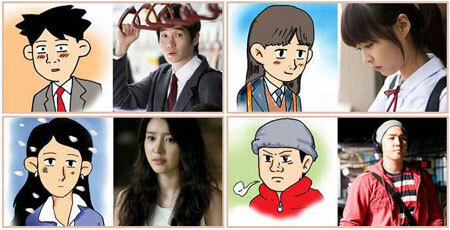 The actors of Hello Schoolgirl and their comic counterparts. The Skinny: Thanks to a great cast, striking visuals and observant storytelling, Ryoo Jang-Ha’s first film in 4 years is a good one. A resoundingly successful film adaptation of Kang Pool’s charming web comic about May-December romances. Kevin Ma: After A.P.T. and Ba:Bo, the third time is the charm for popular web comic artist Kang Pool's works on the silver screen with Hello Schoolgirl, writer/director Ryoo Jang-Ha's follow-up to his overlooked directorial debut Springtime. Hello Schoolgirl already had the potential to be the best Kang Pool adaptation, not only because of its cute, true-to-life story, but also because of its fresh angle on modern youth romances. With an attractive cast and striking cinematography by Jo Sang-Yoon, Hello Schoolgirl is a refreshing comic adaptation that needs no knowledge of the original source material to be enjoyed. Despite its comic roots, Ryoo keeps his screenplay and direction grounded in real life, employing a handheld camera for almost all of his shots and moving the story at a leisurely pace. However, the story’s main topic - romances with age difference as obstacles - is one usually explored in a sensational manner. While the secondary plot, about young soldier Sook (Super Junior member Kang In) working at a government office and wooing older woman Ha-Kyung (Chae Jeong-An), is a safer and more typical plot for these types of stories, the charm of the film mostly comes from the story between Sook’s co-worker, 30-year old Yeon-Woo (Yoo Ji-Tae, now 33), and his 18-year old high school girl neighbor, Soo-Yeong (Lee Yeon-Hee, definitely older than 18). Yeon-Woo is a barely-mature man living alone, while Soo-Yeong is a tougher-than-she-looks young adult whose father left her and her mother years ago. The two develop an unlikely friendship that slowly progresses into a very pure relationship involving UFO catchers, film cameras, some Chungking Express-style sneak-ins, and canned snow. The relationship, believe it or not, is really as pure as they come. Ryoo removes any possibilities of attributing Yeon-Woo’s feelings to any type of fetishes, approaching the romance at a very innocent angle. He (and possibly Kang in his comic) codes these characters carefully, showing Soo-Yeong getting her adult ID card while also showing Yeon-Woo’s bumbling naivete, to make the romance seem perfectly acceptable and even something worth cheering on. Ryoo’s leisurely pacing also helps considerably, putting the two characters’ interactions ahead of forcing plot developments to move the story along. Hello Schoolgirl ultimately becomes more a character study than a plot-driven film, slowly showing how these characters change with very little external interference to move things along. And a lot of credit goes to the two actors for making their characters as believable as they are. In addition to Lee Yeon-Hee’s charming and cute performance as the titular schoolgirl, Yoo Ji-Tae also shows off his acting versatility by showing an awkward vulnerability never seen in his past roles, making his character’s pure intentions convincing without any sense of perversion. On the other hand, while Ryoo employs the same storytelling technique for the storyline between Sook and Ha-Kyung, the older woman’s effort to forget her past boyfriend is too typical of the genre, and Kang’s immature attitude (even for his character’s age) is a little too irritating to make him a likeable or convincing romantic lead when up against Chae Jeong-An. Ryoo has shown in his past as Hur Jin-Ho’s assistant director/co-writer and in his debut film that he’s an observant storyteller, and he brings that same sensibility to Hello Schoolgirl. I may have never read the comic book, but Ryoo makes it easy to see where the charm of the story comes from, and the writer/director not only does that with Kang’s stories and characters, but also with a filmmaker’s visual sensibility. While the film’s handheld look and leisurely pace suggest that this may be the most cinema verite comic adaptation ever made, Ryoo and cinematographer Jo Sang-Yoon also give the film a very polished look that glamorizes reality, but never leaves it. Even though the storytelling pacing is grounded in reality, Ryoo doesn’t hesitate to use computer-enhanced images such as an animated cell phone screen to give the film charm. Hello Schoolgirl may not be the comic with the most potential in terms of ambitious visuals, but its film version is certainly one of the more visually appealing romantic comedies from South Korea in a long time. Notes:  The film shown in the cinema scene is Hur Jin-Ho’s Happiness. Ryoo was an assistant director for Hur and was a co-writer on One Fine Spring Day before making his own directorial debut.